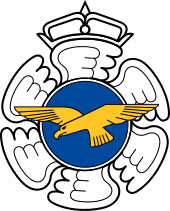 The Finnish Navy (Finnish: Merivoimat, Swedish: Marinen) is one of the branches of the Finnish Defence Forces. The navy employs 2,300 people and about 4,300 conscripts are trained each year. Finnish Navy vessels are given the ship prefix "FNS", short for "Finnish Navy ship" and it is not used in Finnish language contexts. The Finnish Navy also includes coastal forces and coastal artillery. The current Commander-in-Chief of the navy is Rear Admiral Kari Takanen. The navy is organized into two naval commands. The navy also includes the Uusimaa Brigade, where Finnish Marines or Coastal Jaegers are trained. The Uusimaa Brigade is also the only Swedish language unit in the country and it carries on the traditions and battle-honours of the Nyland (Uusimaa) Regiment from the Swedish Army. During the Swedish era, the Finnish Gulf saw many battles between the Swedish and Russian fleets. Many of the Swedish naval bases were located in present-day Finland and many sailors came from Finland (see Archipelago Fleet). During the Russian rule (1809–1917) an entirely Finnish Navy unit, named Suomen Meriekipaasi was defending the Finnish coast, alongside the Baltic Fleet of the Imperial Russian Navy. The Meriekipaasi participated in the Crimean War, albeit mostly with on-shore duties. The Meriekipaasi also manned the coastal batteries at the Santahamina Island during the siege of fortress Viapori in Helsinki. The ships the Meriekipaasi operated included the steam frigates Rurik and Kalevala, named after the Finnish national epic. These ships later served in the Russian Pacific Fleet). The first ships that the independent Finnish Navy obtained were a mix of obsolete vessels left behind by the Russians during the Finnish Civil War and vessels, who had not been able to make the winter voyage to Kronstadt as the Russian Navy retreated from German forces. Thus, the Finnish Navy of the late 1910s and early 1920s consisted of some gunboats (Klas Horn, Matti Kurki, Turunmaa, and Karjala), six S-class torpedo boats, eight C-class torpedo boats, one minelayer (Louhi), several minesweepers, and five T-class minelaying boats. In addition to the warships, the Russians also left behind numerous other types of vessels. Additionally, the Germans handed over two netlayers (Hämeenmaa and Uusimaa) to the Finnish Navy, and these two ships formed the core of the Finnish Navy until the coastal defense ships were commissioned. With the Treaty of Tartu, Finland had to return some of the equipment they had operated earlier. This equipment included three S-class torpedo boats (S3, S4 and S6), the minesweepers Altair, Mikula, MP 7, MP 11, Ahvola, T 12, fifteen tugs, four smaller transports and 54 motorboats. Finland lost three more ships (the torpedo boats C 1, C2 and C3) in supporting the British operations against the Soviets in the Baltic Sea. The three vessels were ordered to stay until the sea froze over, and were damaged beyond repair by the ice. The last remaining C-class torpedo boats was placed in reserve after this incident. 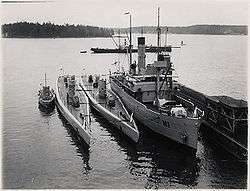 In 1927, after years of wrangling with various plans for how to modernize the navy, and partly due to the loss of the torpedo boat S2 in heavy seas in October 1925, the Parliament of Finland approved a plan to build two coastal defence ships (Panssarilaiva in Finnish), as well as four submarines. Motor torpedo boats were also acquired both from Britain, as well as from domestic sources. New minesweepers were also constructed. The training ship Suomen Joutsen was also acquired. The strength of the Finnish Navy at the beginning of World War II was limited. Some of the planned ships had not yet been constructed and wartime constraints on the economy prolonged ship building times. The navy also had several auxiliary warships, ice-breakers and patrol boats from the coast guard. When the Winter War broke out the Finnish Navy moved to occupy the de-militarized Åland Islands and to protect merchant shipping. In the first month of the war, battles between Soviet ships and Finnish coastal batteries were fought at Hanko, Finland, Utö and Koivisto. At Koivisto and Hanko, the batteries forced Soviet battleships to retire with damage. Finnish efforts to use submarines (Vesikko and Saukko) to sink Soviet capital ships failed. In December 1939 the ice became so thick that only the ice-breakers could still move. The two coastal defence ships were moved to the harbour in Turku where they were used to strengthen the air-defences of the city. They remained there for the rest of the war. Before the Continuation War five more torpedo boats were ordered from Italy. The base that the Soviets had acquired after the Winter War at the Hanko Peninsula divided the areas where the Finnish Navy would operate in two. This included the coastal artillery positions at Russarö and Osmussaar, which guarded the minefields blocking the entrance to the Eastern Gulf of Finland. Large mine fields were laid down in cooperation with the German Kriegsmarine when the war began. The coastal defence ships bombarded the Soviet base at Hanko until the Soviets evacuated Hanko in December 1941. Between 1941 and 1945 some 69,779 mines and mine sweeping obstacles were laid in the Gulf of Finland by Finnish, Soviet and German naval forces. The Soviet Navy laid 16,179 mines and 2,441 mine sweeping obstacles, the Finnish navy 6,382 mines, and the German navy's vessels, submarines and aircraft laid some 45,000 mines, of which 3,000 were magnetic mines. The last mine sweeping season was held in 1957, but the mine danger continued for some 10 more years, and there are still hundreds of World War II-era mines in the Baltic Sea. The greatest loss of the Finnish Navy occurred on September 13, 1941 when the Ilmarinen ran into a mine and sank. 271 sailors lost their lives and only 132 were rescued. Most of the survivors later served in the Lake Onega flotilla, using old captured ships, including a steam engined paddlewheeler. In 1942 the main focus of the war at sea was on the anti-submarine warfare. Finnish and German naval forces tried to prevent Soviet submarines from gaining access to the Baltic Sea. However, the mine barrier had proven to be insufficient to completely stop Soviet submarines activities. The Soviet subs sank 18 ships, seven of which were Finnish. 12 Soviet submarines were also sunk - three by Finnish submarines. The next step in submarine warfare was to completely block the Gulf of Finland with anti-submarine nets between Naissaar and Porkkala. This was done immediately after the ice cover melted on the sea. That barrier with its accompanying minefields effectively contained Soviet Naval vessels to the eastern part of the Gulf of Finland until the autumn of 1944, when the Soviets were able to use Finnish coastal seaways to circumvent the barrier. In spring 1942 Finnish forces captured the island of Gogland. In July 1942 the Soviets made an attempt to occupy the small island of Sommers in the Gulf of Finland. The Soviets lost several smaller vessels (patrol and torpedo boats) together with 128 men. One-hundred and two Soviet soldiers were taken prisoner. During 1943 the navy received 14 new torpedo boats which were used to replace the old pre-war ones. In 1944 the Soviets launched a major offensive against Finland, during which the navy fought in support of Finnish land forces the Gulf of Vyborg. In the end the ships were forced to pull out. In September 1944, the military operations against Germany started. The main focus was in the north, the Lapland War, but the Germans also tried to capture Suursaari in an operation named Tanne Ost. The attack was repulsed. During the battle, Finnish motor torpedo boats sank several German vessels. The last action of the Finnish Navy was during the amphibious landing of troops from Oulu in Tornio. The Finnish gunboats successfully shelled German batteries, which had posed serious threat for the transport ships, while their anti-aircraft batteries defended the convoy from German air attacks. The navy also hunted German U-boats in the Baltic, laying its last mines of the war while doing this. After the Finnish-Soviet armistice, the Finnish Navy was ordered to participate in the demanding mine clearance operation. The operation lasted until 1950. There were many casualties among the clearance crews. The war time fleet was replaced in the 1950s and 1960s. 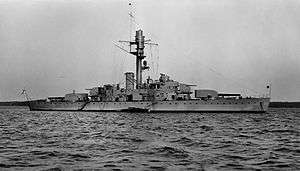 Due to Finland's neutrality she tried to balance her purchases of equipment between the two blocs and also tried to produce its own vessels. A Bay class frigate (Matti Kurki), two Dark class fast patrol boats (Vasama 1 and Vasama 2) and four BYMS class minesweepers were bought from the UK, two Riga class frigates (Hämeenmaa and Uusimaa) and four Osa II class fast attack craft (Tuima class missile boats) were obtained from the Soviet Union. Some of the vessels, such as two Turunmaa class gunboats (Turunmaa and Karjala) and the Nuoli class fast attack craft were produced domestically. The Paris peace talks in 1947 resulted in a treaty that limited the offensive capability of the Finnish military. For the navy, this meant a limitation to a fleet of no more than 10,000 tons and 4,500 men. As for the weaponry, torpedoes, submarines, mines and missiles were forbidden. The restrictions were eased in the 1960s and missiles and mines were allowed. The torpedo restriction was not either fully exercised as the Riga class frigates were equipped with torpedoes and a number of torpedo boats were manufactured as gunboats that could quickly be converted to carry torpedoes. The cold-war limitations are no longer in place (they were nullified with the breakup of the Soviet Union), but the size of the navy is still roughly the same. In the late 1990s, the Finnish Navy was developing a new missile squadron called Laivue 2000 (English: Squadron 2000). At first it was supposed to consist of two Hamina class missile boats (already built at this date) and four Tuuli class hovercraft. The Navy experimented with one prototype hovercraft, but announced in 2003 that the Tuuli class would not enter active operations and that no more of them would be built. Instead two new Hamina class missile boats were built, and the extra weaponry from the hovercraft were installed on the Hämeenmaa class minelayers. The cable layer Putsaari and pollution control vessel Hylje were replaced in 2011 by a new multipurpose vessel built by the Uudenkaupungin Työvene shipyard. A new icebreaking oil spill response vessel was named Louhi on 8 March 2011. The 1979-built minelayer Pohjanmaa was initially scheduled for decommissioning in 2013, but it is now expected to remain in service until 2015. In October 2013, minelayer Hämeenmaa took over the role of flagship of the Finnish Navy. In February 2015, it was reported that fatigue damage had been discovered in the hulls of the recently refitted Rauma-class missile boats and that the vessels would be removed from active duty to prevent further damage until its cause has been found. However, while peace-time use is now limited, the missile boats can be taken back into full service if needed. As the Squadron 2000 is finished, the Navy has shifted its attention to mine prevention and will replace the old Kuha- and Kiiski-class minesweepers with three Katanpää-class mine countermeasure vessels, previously known as the MCMV 2010 and MITO classes. In October 2012, Finnish Navy signed a 34 million euro contract for 12 fast transport boats with an option for more vessels with Marine Alutech, a Finnish company that has also built the Uisko- and Jurmo-class transport boats. The 19-metre (62 ft) Jehu transport boats can carry 25 troops and have a maximum speed in excess of 40 knots (74 km/h; 46 mph). Defensive capability will be provided with a remotely controlled turret capable of providing fire support during a landing operation. The new class of landing craft has been named Jehu class. The next generation surface combatant, which is going to be bigger than the current missile boats and more capable for international co-operation, is currently in pre-development stage. This new class of multi-purpose naval vessels, referred to as Monitoimialus 2020 ("Multi-purpose vessel 2020") or Laivue 2020 ("Squadron 2020") in the preliminary papers, is intended to replace the Hämeenmaa- and Pohjanmaa-class minelayers and Rauma-class missile boats as they are retired. The goal is to replace seven vessels with at least four new surface combatants. In September 2015, the Finnish Minister of Defence Jussi Niinistö officially authorized the Finnish Navy to start developing "Squadron 2020" and the official Request for Information (RFI) was sent to the shipyards in December. Then Finnish Defence Forces with Rauma Marine Constructions sign letter of intent (LOI) for construction four vessels under program "Squadron 2020" on 14 September 2016. The design stage is planned to continue until 2018 and the vessels will be built in 2019–2024. The projected cost of four vessels with a lifespan of at least 35 years is about 1.2 billion euro. Coastal forces include both coastal infantry and the Marines (Coastal Jaegers) as well as the remnants of the coastal artillery units, which have moved from fixed and towed guns to truck-mounted and infantry-carried anti-ship missiles. The towed guns are being phased out as obsolete and all artillery-based coastal defences are to be retired in the near future. The Euro-Spike coastal missile system was taken into use in 2005 at the Uusimaa Brigade and the older truck-mounted RBS-15 missiles have been complemented with new, upgraded RBS-15 Mk.3 (known as MTO-85M). Wikimedia Commons has media related to Naval ships of Finland. Wikimedia Commons has media related to Navy of Finland. ↑ Auvinen, Visa (1983). 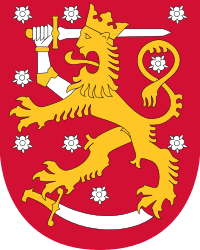 Leijonalippu merellä [Lion flag at sea] (in Finnish). Pori, Finland: Satakunnan Kirjapaino Oy. ISBN 951-95781-1-0. ↑ Uudenkaupungin Sanomat: Kaapelialus Putsaari jää eläkkeelle ensi vuonna. 2010-05-07. Retrieved 2011-01-20. ↑ New oil and chemical spill response vessel was given the name Louhi. Suomen Ympäristökeskus (SYKE), 8.3.2011. ↑ Miinalaiva Pohjanmaa jätti hyvästinsä torstaina - katso video. Ilta-Sanomat, 23 August 2013. Retrieved 2014-05-23. ↑ Rauma-luokan ohjusveneet käyttökieltoon. Turun Sanomat, 18 February 2015. Retrieved 2015-02-21. ↑ Hyllytetyt ohjusveneet tarvittaessa käyttöön. Turun Sanomat, 19 February 2015. Retrieved 2015-02-21. ↑ Merivoimat tilaa nopeita kuljetusveneitä. Puolustusministeriö, 15 October 2012. Retrieved 2012-10-22. ↑ Marine Alutech Oy Ab supplies for Finnish Navy Watercat M18 AMC High Speed landing crafts. Marine Alutech, 15 October 2012. Retrieved 2014-04-03. ↑ Merten mittaajat. Ruotuväki, 10/08. ↑ Merivoimat haluaa nopeita ja hiljaisia sotalaivoja. Helsingin Sanomat, 18 October 2014. Retrieved 2015-05-30. ↑ Hallituksen esitys 12/2010. FINLEX. 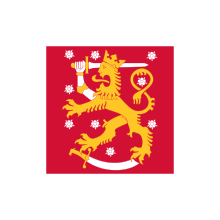 ↑ Merivoimien uudet alukset tuonevat töitä kotimaisille telakoille. Turun Sanomat, 11 May 2015. Retrieved 2015-05-30. ↑ "Rauma Marine Constructions and the Finnish Defence Forces sign letter of intent for construction of four vessels" (Press release). Rauma Marine Constructions. 14 September 2016. Retrieved 19 September 2016. ↑ Merivoimien taistelualusten rakentamisen tietopyynnöt liikkeelle. Merivoimat, 18 December 2015. Retrieved 2015-12-18.